Corresponding author: Mental Health Research and Treatment Center, Department of Psychology, Ruhr-Universität Bochum Massenbergstraße 11, 44787 Bochum, Germany. Table 1. Summary of hierarchical linear regression analysis. Background/Objective: Suicide ideation is common in depressed patients. However, no studies to date have examined whether pretreatment suicide ideation is associated with poorer outcomes after cognitive-behavioral therapy for adult depression. Method: 475 depressed outpatients (age: M=39.9 years, SD=11.71; 60.2% female) took part in a pre-treatment and a post-treatment assessment. Pre-treatment suicide ideation measured with the BDI suicide item was considered as a predictor of treatment outcomes – controlling for age, gender, number of attended therapy sessions, as well as pre-treatment depression severity. Results: Hierarchical regression revealed that age, gender, number of completed therapy sessions and depression severity at baseline could explain 25% of the variance in post-treatment BDI-scores. Adding suicide ideation significantly improved the amount of variance explained to 27%. Treatment outcomes were worse for patients with more severe depression, suicidal patients, patients receiving more therapy-sessions and older patients. Conclusions: Suicide ideation added only little incremental variance to the prospective prediction of post-treatment depression severity. Depressed patients with suicide ideation can attain almost as good treatment outcomes as patients without suicide ideation, which is a clinically encouraging result. Antecedentes/Objetivo: La ideación suicida es común en pacientes deprimidos. No obstante, hasta la fecha no hay estudios que hayan examinado si la ideación suicida previa al tratamiento está asociada con resultados más pobres de la terapia cognitivo-conductual para la depresión en adultos. Método: 475 pacientes ambulatorios deprimidos (edad: M=39,9 años; DT=11,71; 60,2% mujeres) participaron en una evaluación previa al tratamiento y posterior al tratamiento. La ideación suicida previa al tratamiento medida con el ítem “suicidio” del BDI se consideró como predictor de los resultados del tratamiento – controlando la edad, el género, el número de sesiones de terapia recibidas así como la gravedad de la depresión previa al tratamiento. Resultados: la regresión jerárquica reveló que la edad, el género, el número de sesiones de terapia recibidas y la gravedad de la depresión al inicio del estudio pudieron explicar el 25% de la varianza de las puntuaciones del BDI después del tratamiento. Añadir la ideación suicida elevó significativamente el procentaje de varianza explicada al 27%. Los resultados del tratamiento fueron peores para los pacientes con depresión más grave, pacientes con tendencias suicidas, pacientes que recibieron más sesiones de terapia y pacientes mayores. Conclusiones: la ideación suicida agregó solo una pequeña variación incremental a la predicción prospectiva de la gravedad de la depresión posterior al tratamiento. Los pacientes deprimidos con ideación suicida obtienen casi el mismo beneficio de la terapia cognitivo-conductual que los pacientes deprimidos sin ideación suicida, siendo este un resultado alentador desde un punto de vista clínico. Suicide ideation and suicidal behavior is highly prevalent in persons suffering from a variety of mental illnesses like post-traumatic stress disorder (PTBS; Dixon-Gordon, Tull, & Gratz, 2014), substance use disorder (SUD) or unipolar depression (Rogers et al., 2018). Suicidal behavior entails all shapes of behavior like planning and attempting suicide (Borges, Angst, Nock, Ruscio, & Kessler, 2008). Studies have shown that some disorders with high agitation and poor impulse control like PTSD or SUD are especially linked to attempting suicide while unipolar depression is highly predictive of suicide ideation (SI; Nock, Hwang, Sampson, & Kessler, 2010). SI is associated with severity of depression (Teismann et al., 2018) and deeply disturbing to most patients (Crane et al., 2014). Most notably, SI is a risk factor for completing suicide (Klonsky, May, & Saffer, 2016). Although it seems plausible to assume that psychological treatments for depression also affect SI, this assumption has lately been called into question. In their meta-analysis Cuijpers et al. (2013) found only three randomized controlled studies for adult depression with SI and suicide behavior as a specified outcome, indicating small and non-significant effects of psychotherapy for depression on SI. This finding complements previous research suggesting that suicidal thoughts and behavior are not merely an epiphenomenon of depression but a separate nosological entity (Forkmann, Gauggel, Spangenberg, Brahler, & Glaesmer, 2013), in need of specific therapeutic strategies (Meerwijk et al., 2016). On this background the question arises, whether SI is also associated with poorer outcomes after therapy. Up to now, empirical evidence on this question is rare and rather inconclusive. One study found no difference in response to Mindfulness-based cognitive therapy between depressed patients with or without SI (Kenny & Williams, 2007). Another study found that depressed elderly patients receiving pharmacotherapy and interpersonal therapy nearly benefitted to the same extend regardless of their SI (Szanto et al., 2001). Yet, patients with SI had higher relapse rates. In a different study, depressed veterans with or without SI experienced a comparable reduction of BDI-scores after cognitive-behavioral therapy (CBT), SI was, however, associated with higher BDI scores pre- and post-treatment (Brown et al., 2016). Finally, depressed adolescents with SI were more likely to be depressed than non-suicidal adolescents after supportive (Barbe, Bridge, Birmaher, Kolko, & Brent, 2004), medical or cognitive-behavioral interventions (Curry et al., 2006). Taken together, there is some evidence that supports the hypothesis that SI is associated with poorer treatment outcomes, however, there are no studies to date investigating whether pretreatment SI is associated with poorer outcomes after CBT for adult depression. The objective of this study was therefore to test the predictive validity of SI for treatment outcomes in routine care for outpatients with unipolar mood disorders. The study is an ex-post facto study of patients undergoing CBT between September 1990 and October 2014 at our outpatient university clinic in Germany. Data was extracted from our digital data warehouse in which all patients’ histories are saved. 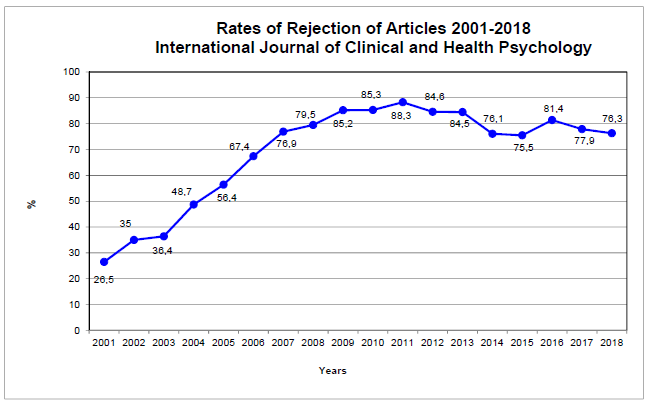 Participants had to meet the following criteria: (a) DSM-IV (American Psychiatric Association APA, 1994) criteria for Major Depression and/or Dysthymia or depression not otherwise specified; (b) at least 18 years of age; (c) complete pre- and posttreatment data. Diagnoses were made by trained clinical psychologists using the Structured Clinical Interview for DSM-IV Diagnosis (SCID-I; First, Spitzer, Gibbon & Williams, 1996). All patients gave written informed consent that their data could be used anonymously in publications of our workgroup. In total 1,604 patients were treated for mood disorders in this time frame, of these 475 completed both a pre - and a post- therapy assessment, resulting in n=475 participants (60.2% female; age: M=39.9 years, SD=11.71; range: 18-68). Three hundred sixty-six (71.1%) patients suffered from a Major Depression, n=77 (16.2%) from Dysthymia, n=23 (4.8%) from a depressive disorder not otherwise specified and n=9 (1.9%) from a double depression. One-hundred seventy-eight (37.5%) suffered from at least one further comorbid disorder at the pretreatment assessment. The study was approved by the Ethics Committee of the Faculty of Psychology at the Ruhr-University Bochum. All patients received routine-care individual CBT (session number: M=51.6, SD=25.1 Range 5-150). Therapies were conducted by 125 clinical psychologists (68% female). All therapists were in their second or third year of a three-year post-graduate CBT-training. All therapists were supervised on a regularly basis by experienced senior clinicians. Suicidal ideation was measured by item no 9 from the Beck Depression Inventory (BDI; Beck, Epstein, Brown, & Steer, 1988). The suicide item of the BDI has repeatedly been used in clinical studies and it has been shown to be a strong predictor of suicide attempt and death (Green et al., 2015). The BDI is a widely-used 21-item self-report measure that surveys depressive symptoms on a 4-point severity scale. The internal consistency for the BDI in the current sample was α=.87 at pre-treatment assessment. The suicide item was excluded from the BDI-sum score to avoid overlapping and thus part-whole correlations. All measures were administered prior (pre-treatment) and after (post-treatment) CBT. Changes in symptom severity and SI were analyzed using t-tests for dependent samples and effect sizes (Cohens d). A hierarchical linear regression analysis, with age, gender, number of completed therapy sessions, depression severity, presence of at least one comorbid diagnosis and SI at baseline as independent variables and post-treatment depression severity as dependent variable was conducted. Regression assumptions were checked using graphical methods (normality of residuals, homoscedasticity), variance inflation factors and cooks distance. Residuals were distributed normally, all parameters had VIF-scores below 1.3 and no observations had a particularly large influence. Because the homoscedasticity assumption was not met, we report heteroscedasticity-consistent standard errors (Hayes & Cai, 2007). All analyses were performed with SPSS Version 24. 280 participants (41.1%) had a SI score ≥ 1, which is the proposed cut-off score for serious SI (Green et al., 2015) at pre-treatment and 142 (29.9%) at post-treatment assessment. T-tests for dependent samples revealed that depression severity, [pre-treatment: M=20.72, SD=8.87; post-treatment: M=10.71, SD=10.05; t(474)=-22.06, p<.001, r=.71] and SI, [pre-treatment M=0.74, SD=0.77; post-treatment: M=0.39, SD=0.69; t(474)=-10.07, p<.001, r=.42] declined significantly from pre- to post-treatment. Yet, it has to be noted that only change in depression severity showed a large effect size (Cohen's d=1.32), while the effect size for SI was much smaller (Cohen's d=0.44). Hierarchical regression revealed that the variables defined in the first step (age, gender, number of completed therapy sessions, comorbid diagnoses, depression severity at baseline) could explain 25% of the variance in posttreatment BDI-scores. Adding SI at baseline in the second step significantly improved the amount of variance explained to 27%, F(1, 465)=14.478; p < .001. Inspection of the regression coefficients of this model (see Table 1) revealed no differences in outcomes between men and women and patients with and without comorbid diagnoses, but outcomes were worse for patients with more severe pre-treatment depression (b=0.42, p < .001), suicidal patients (b=2.39, p < .01), patients requiring more therapy-sessions (b=0.07, p < .001), and older patients (b=0.10, p < .01). Summary of hierarchical linear regression analysis. Note: R2 model 1=25%; R2 model 2=27%; 1Depression severity excluding the BDI SI item. The goal of the current study was to investigate whether pretreatment SI in depressed adults is associated with poorer treatment outcomes after CBT. SI emerged as a significant predictor of post-treatment depression severity – even when controlling for age, gender, number of attended therapy sessions, comorbidity as well as pretreatment depression severity. However, in light of the fact that even small effects may become significant with large samples, it is important to inspect the magnitude of this effect. SI added only little incremental variance to the prospective prediction of post-treatment depression severity. Again, this results underline the view, that SI is not only a symptom of depression, but a distinct phenomenon at least partially independent of depression (Forkmann et al., 2013). Clinically, these findings suggest therapeutic optimism. Depressed patients with SI nearly take the same benefit from CBT as depressed patients without SI (cf. Barbe et al., 2004; Szanto et al., 2001). We encourage therapists to share this fact with their patients to induce optimism, because patients often worry about their suicidal thoughts (Crane et al., 2014). As in previous studies (Stiles-Shields, Corden, Kwasny, Schueller, & Mohr, 2015) the best predictor of posttreatment depression severity was pretreatment depression severity. Contrary to large scale studies that found an adverse impact of comorbid disorders on suicidal behaviors and on treatment outcomes across a broad spectrum of disorders (Nock et al., 2010; Tunvirachaisakul et al., 2018), we did not find a systematic difference in treatment outcome between those with/without a comorbid disorder. Yet, our finding concerning comorbidity should be interpreted with caution, since we were not able to distinguish between specific comorbid diagnoses. Pre-post analyses showed a significant reduction in depressive symptoms with an effect size that is comparable to other studies on routine care CBT for depression (Schindler & Hiller, 2010). However, CBT for depression had only a modest effect on SI, complementing previous research pointing to the necessity of specific interventions to treat SI and suicide behavior (Meerwijk et al., 2016), which are still scarce (Hawton et al., 2016). Future research should establish the efficacy and effectiveness of such interventions in reducing SI and suicidal attempts. Therapist should use these specific interventions (like CBT to prevent suicide; Wenzel, Brown & Beck, 2009) when confronted with SI in depressed patients and not expect for SI to vanish with depression. One limitation of this study is the one-item assessment of SI. Yet, there is strong evidence for its predictive ability (e.g. Green et al., 2015). Furthermore, this is a naturalistic study without a strict treatment regimen; therefore we do not know how often SI was discussed in therapy and we do not have information about other potential predictors like for instance the course of depression or sociodemographic variables (Richards et al., 2016). Nonetheless, the current results point to the fact that pretreatment SI does not preclude beneficial treatment outcomes, which is a clinically encouraging result. The study was supported by the Alexander von Humboldt-Professorship of Jürgen Margraf. The funding source was not involved in the interpretation of the data, in the writing of the report and in the decision to submit the article for publication. R.P. Barbe, J. Bridge, B. Birmaher, D. Kolko, D.A. Brent. Suicidality and its relationship to treaatment outcome in depressed adolescents. G. Borges, J. Angst, M.K. Nock, A.M. Ruscio, R.C. Kessler. Risk factors for the incidence and persistence of suicide-related outcomes: A 10-year follow-up study using the National Comorbidity Surveys. G.K. Brown, B.E. Karlin, M. Trockel, M. Gordienko, J. Yesavage, C.B. Taylor. Effectiveness of cognitive behavioral therapy for veterans with depression and suicidal ideation. C. Crane, T. Barnhofer, D.S. Duggan, C. Eames, S. Hepburn, D. Shah, J.M.G. Williams. Comfort from suicidal cognition in recurrently depressed patients. P. Cuijpers, D.P. de Beurs, B.A.J. van Spijker, M. Berking, G. Andersson, A.J.F.M. Kerkhof. The effects of psychotherapy for adult depression on suicidality and hopelessness. J. Curry, P. Rohde, A. Simons, S. Silva, B. Vitiello, C. Kratochvil, M. Reinecke, N. Feeny, K. Wells, S. Pathak, E. Weller, D. Rosenberg, B. Kennard, M. Robins, G. Ginsburg, J. March, TADS-Team. K.L. Dixon-Gordon, M.T. Tull, K.L. Gratz. Self-injurious behaviors in Posttraumatic Stress Disorder: An examination of potential moderators. M.B. First, R.L. Spitzer, M. Gibbon, J.B.W. Williams. Structured Clinical Interview for DSM-IV Axis I Disorders. T. Forkmann, S. Gauggel, L. Spangenberg, E. Brahler, H. Glaesmer. Dimensional assessment of depressive severity in the elderly general population: Psychometric evaluation of the PHQ-9 using Rasch Analysis. K.L. Green, G.K. Brown, S. Jager-Hyman, J. Cha, R.A. Steer, A.T. Beck. The predicitive validity of the Beck Depression Inventory suicide item. K. Hawton, K. Witt, T. Taylor, E. Arensman, D. Gunell, P. Hazell, E. Townsend, K. Heeringen. Psychosocial interventions following self-harm in adults: A systematic review and meta-analysis. Using heteroskedasticity-consistent standard error estimators in OLS regression: An introduction and software implementation. D.E. Klonsky, A.M. May, B.Y. Saffer. Suicide, suicide attempts and suicidal ideation. E.L. Meerwijk, A. Parekh, M.A. Oquendo, I.E. Allen, L.S. Franck, K.A. Lee. Direct and indirect psychosocial and behavioral interventions to prevent suicide and suicide attempt: A systematic review and meta-analysis. M. Nock, I. Hwang, N. Sampson, R. Kessler. Mental Disorders, Comorbidity and Suicidal Behavior: Results from the National Comorbidity Survey Replication. D. Richards, T. Richardson, L. Timulak, N. Vigano, J. Mooney, G. Doherty, C. Hayes, J. Sharry. M.L. Rogers, I.H. Stanley, M. Hom, B. Chiurliza, M.C. Podlogar, T.E. Joiner. Conceptual and empirical scrutiny of covarying depression out of suicidal ideation. Therapy effects and response rates of cognitive-behavioral treatment for unipolar depressive patients in an outpatient clinic. C. Stiles-Shields, M.E. Corden, M.J. Kwasny, S.M. Schueller, D.C. Mohr. Predictors of outcome for telephone and face-to-face administered cognitive behavioral therapy for depression. K. Szanto, B.H. Mulsant, P.R. Houck, M.D. Miller, S. Mazumdar, C.F.I. Reynolds. Treatment outcome in suicidal vs. non-suicidal elderly patients. T. Teismann, T. Forkmann, J. Brailovskaia, P. Siegmann, H. Glaesmer, J. Margraf. Positive mental health moderates the association between depression and suicide ideation: A longitudinal study. C. Tunvirachaisakul, R. Gould, M.C. Culson, E. Ward, G. Reynolds, R. Gathercole, H. Grocott, T. Supasitthumrong, A. Tunvirachaisakul, K. Kimona, R. Howard. Predictors of treatment outcome in depression in later life: A systematic review and meta-analysis. A. Wenzel, G. Brown, A.T. Beck. Cognitive therapy for suicidal patients: Scientific and clinical applications.